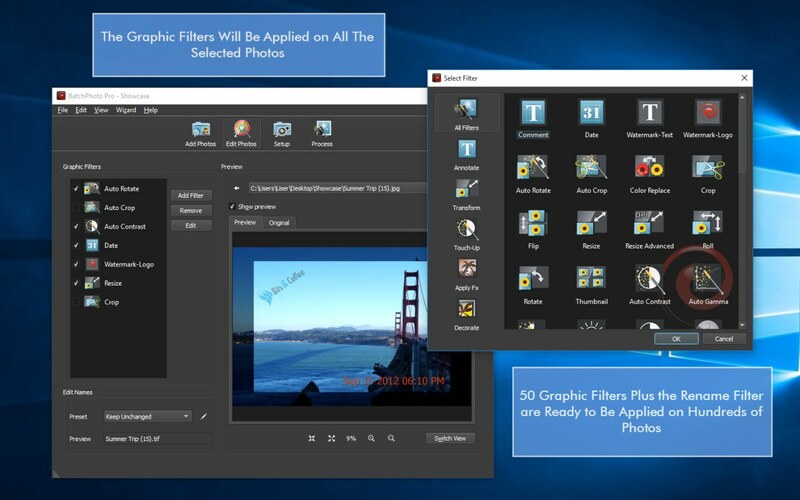 Adobe’s Photoshop has been a benchmark in the photo editing field for quite some time. For years it has been a central pillar for both professionals and amateurs in the search of optimal image enhancement techniques. And still is, because it remains one of the most powerful programs when it comes to image manipulation. Nevertheless, the online environment abounds today in tops and lists of Photoshop alternatives. 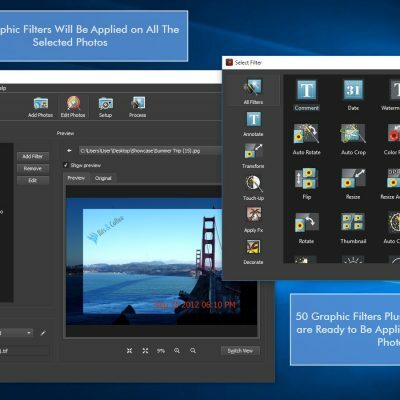 Although there isn’t a program out there that can replace by itself Adobe’s complex software, it is fair to say that one can find various tools to try and check what they’re capable of. Naturally, depending on users’ necessities and individual preferences, these tools will be quite diverse when it comes to capabilities, features and user interface. Some resort to photo editors for aesthetic reasons, as they want to create a certain type of artwork or perhaps improve the aspect of an image. Others are determined to improve productivity, as they have to apply repeatable actions like resizing or watermarking to dozens of photos. If you happen to be in the position of having to constantly edit numerous files at once, then you definitely need a tool to automate the operations for you. Let’s say you have to resize one hundred images at once and want to perform this operation using Photoshop. In order to do any form of batch editing you have to record a custom action and then apply that specific action to a group of images. This is one way of accomplishing the task. Another option would be to try a tool which is particularly designed for batch processing. 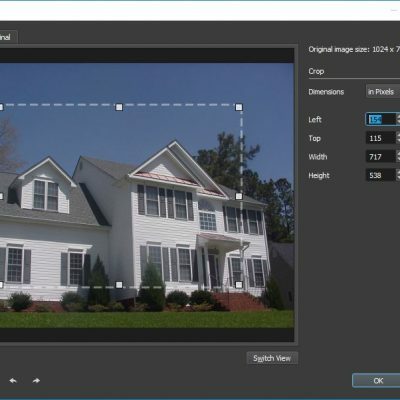 With such a software all you have to do is add your photos, apply the Resize filter (you can select the width and height in pixels or percentages), choose the destination folder and start processing, that’s it. Again, in Photoshop the same principles as above apply in case you want to watermark your pictures. You have to go through a certain number of steps before starting the batch processing. 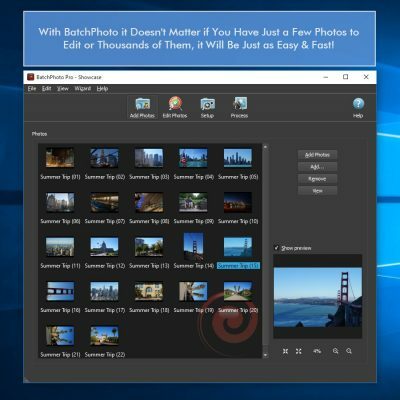 As an alternative, you can try a specialized tool that also lets you apply text or logo watermarks on dozens of photos at once and save the settings for later use. The process is the following: you add your chosen pics, apply the Watermark filter, select the output folder and process. 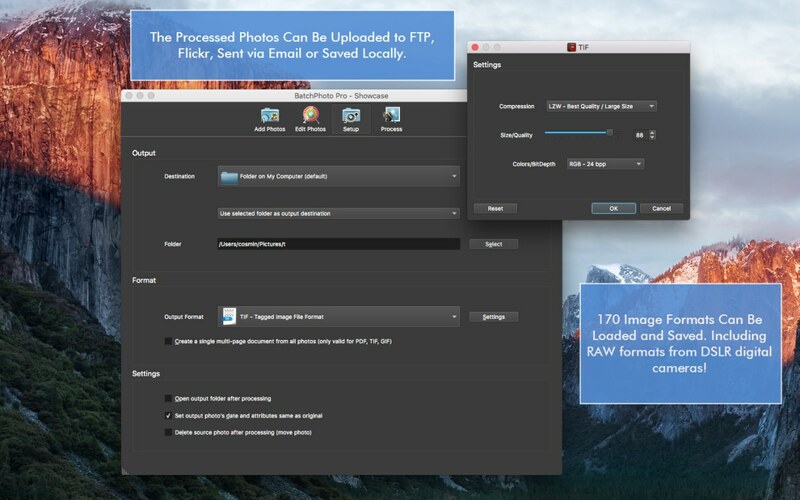 Bulk conversion is many times required, especially for those who shoot in RAW. Images in this format are not suitable for printing or online use and therefore have to be converted to a more popular format like TIFF for example. This can be easily done in one single session with the aid of a software designed for this type of operations. 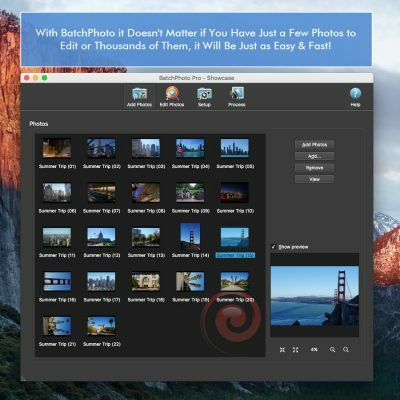 All you have to do is add your images and go directly to Setup (you can skip Edit Photos if you don’t want to add any filters). Here you can choose the desired Output Format, in our particular case TIFF, and then simply start processing. 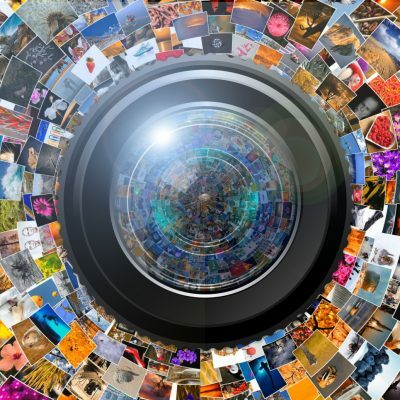 Professional or amateur photographers, we all feel the urge to rename our images sometimes. Some of us do it because they just can’t stand seeing those meaningless numbers assigned by their digital cameras, others because they wish to associate the pictures with a certain event or place. Regardless of the reason, you can easily give your photos significant names using a specialized tool. You can choose to rename your images with their date, with the folder’s name or you can just type the preferred keyword. At first view this may seem something pretty basic, because all modern digital cameras have the capacity to stamp the date and time on a photo. This is actually true, but there are some drawbacks. For starters, you can’t really do anything about the color, size or placement of the stamp. Second of all, once you add the information on the image, it stays there. You can’t remove it if you want to. So the best solution is to resort to an editor specialized in date stamping in bulk like BatchPhoto. Such a software will allow you to fully customize the appearance of the stamp (size, color, transparency, rotation), as well as its position on the image. Moreover, you will be able to customize the date and time format by choosing from a wide range of preset date formats. Photoshop with the action of my choice. I could run 50 through while I was able to work on something else. Now when I try to batch. I have to press open image and ok before every single image. Do you have any idea how to stop that?